How Fast Can Google Autocomplete Change? I’ve been waiting for a hot news story to see how quickly Google’s autocomplete suggestions change and now we have one. Justin Bieber was arrested early on the morning of Thursday, January 23, 2014 in Miami. The earliest dated online news report I could find for the story came from TMZ, which published it’s article at 10:14 am PST. But what’s more interesting is that within a week, all of the negative suggestions were gone! Below, we’ll take a look at what happened – in various countries – and see if there’s anything we can learn from the data. Of course, the story has gone viral and by the time I checked Google autocomplete results for Justin Bieber, “mugshot” was already one of the top 4 suggestions. So, it took less than 6.5 hours for enough content and search activity to cause Google’s autocomplete algorithm to update in the US. In Miami, 1 week later, the negative suggestions are gone. But what’s interesting is that 30 minutes ago, I still saw “mugshot” as a suggestion in Portland, OR, New York, NY, and Houston, TX. I did not capture a screenshot. Now, as I check all those cities, the results are exactly the same as Miami, shown below. Why Did “Mugshot” Become A Suggestion? The image below is a screenshot of Google Keyword Planner data for all keywords that appear in the suggestions above – for both January 23rd and January 30th. The numbers at far right under “Avg. monthly searches” are a 12-month average of the monthly search volume for each term. If we didn’t know better, we might think “justin bieber mugshot” is the 8th most popular search term over the last year. By looking at the data above, we might assume Google would ALWAYS show “mugshot” as one of Justin Bieber’s suggestions. But we know this isn’t the case, since the suggestion was gone within a week and 2 months later, the “mugshot” suggestion is STILL gone. Let’s take a closer look at the data:. Wow! Look at that spike in traffic from 110 searches per month in December to 673,000 searches per month in January. As the story died down, February dropped down to 27,100. It appears as though this surge in search activity is directly related to the term “mugshot” appearing as a suggestion in January. The massive drop in February probably explains why we no longer see “mugshot” as a suggestion in the United States. Let’s look at a few other terms. With a 12-month average of 90,500 searches per month, it’s the 4th most searched term on our list and it’s consistency is likely why we see it appearing so frequently. Like “twitter,” “Justin Bieber Instagram” also appears as a suggestion on January 23, January 30, and March 24. That’s because it’s almost a carbon copy of “twitter,” with 90,500 per month over the last year and very little fluctuation from one month to the next. “Songs” was not a suggestion on January 23rd, but it was on January 30 and it still is on March 24. At 110,000 searches per month over the last year, it’s tied with “and selena gomez” as the #1 suggestion on our list. Why Isn’t “Mugshot” A Google Suggestion Any Longer? 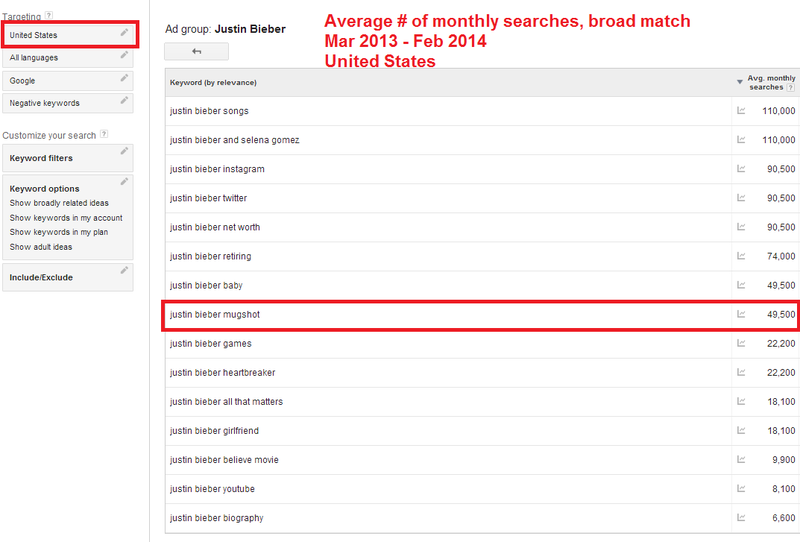 When we look at the monthly search activity for all of the suggestions that appear in January and March 2014, the spike in search activity for “Justin Bieber mugshot” stands out like a sore thumb. It makes sense that the term would’ve appeared as a suggestion while the story was hot and as soon as the story died down, so did the search activity. When that happened, the suggestion disappeared, too. I’d surmise the following from this data. A dramatic surge in search activity can cause a term to appear as a suggestion in Google, but unless that search activity is maintained, the suggestion will disappear. Of course, this assumes that there are enough other search terms with adequate annual search volume to overcome the spike for the negative term. I’d theorize that a client with a sudden surge of activity for a negative term might see similar results: If they have plenty of other positive terms with high levels of monthly search activity, the negative term may disappear quickly after the story dies. Unfortunately, many of the clients we work with have very low search volume, so a negative spike can be much longer lasting. If you’re interested in going further, I’ve broken out Justin Bieber’s suggestions in different countries when the story broke in January 2014. Below is that information. It’s interesting to see the suggestions for the UK are different. I’m guessing that because many Englander’s were awake when news of the story first rolled in, they began feverishly searching the internet looking for details. Justin Bieber “jail”, “prison”, and “arrest” already populate the suggestions. Here’s how it looks in the UK 1 week later. Notice that ALL THREE negative terms are now gone. In Australia, citizens were either going to bed when the story broke, or they just don’t care about Justin Bieber. Either way, there hasn’t been enough search activity “Down Under” to update the suggestions. And here’s how it looks 1 week later in Australia. No changes. 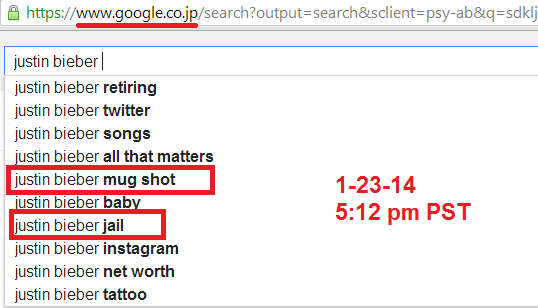 Lastly, I checked google.co.jp to see what how the news affected Google autocomplete in Japan. Here, we see results more inline with the United States. One week later, “mug shot” and “jail” have disappeared in Japan, too. 1) Clearly, Google Autocomplete can update very quickly, if there’s enough content and high search activity. We won’t know how much search activity for the negative terms until Google Keyword Planner data is updated. This usually occurs in a couple of months. Three of the four countries I checked showed at least one of the negative terms related to the story within 6.5 hours of it being reported. That’s fast! We also see how quickly negative terms can fall out of Google Autocomplete, as just one week later, all 4 countries we checked had no negative suggestions. Keep in mind, of course, we are dealing with an international superstar; we don’t see this much volatility with our clients. 2) Usually when we do work for a client, we ramp up search volume for positive terms starting at a modest level. Most low volume cases take about 4 months to see changes. This conservative approach has worked well. The fact that autocomplete can change so quickly, might suggest that we can get faster results for clients if we speed up the search activity. Further testing is needed on this before we roll it out, as we need to consider how much content is available (definitely a factor) and we don’t want to set off a Google filter that would cause the suggestion never to appear. More data to come as time passes and the story ages. If you would like a quote on correcting a Google autofill problem, please call 503-890-6663. This entry was posted in Uncategorized on January 23, 2014 by Mike Munter. If you’re only seeing four suggestions when you start typing a search phrase in Google, you probably have to change your preferences to never show Google instant results. It’s also interesting to see that in addition from going from 4 suggestions to 10 suggestions, we can see that the predictions Google serves up are different. If you want to see all ten of Google’s suggestions, go to https://www.google.com/preferences and select the option “Never show Instant results” under the Google Instant predictions section. Don’t forget to scroll to the bottom and hit the blue SAVE button. This will save your settings for whenever you sign in to your account. Now, you’ll see all 10 suggestions (if there are 10), when you perform your search queries. I couldn’t find data to tell whether Google Instant is on or off by default or what percentage of people turn if off entirely. See Google’s official statement of use on Google Instant. Have a problem with Google autofill? Call 503-890-6663 for a quote! This entry was posted in Uncategorized on January 20, 2014 by Mike Munter. 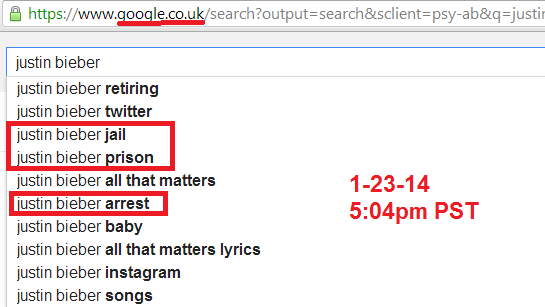 In a few rare cases, I’ve seen Related Searches appear ABOVE the organic search results. 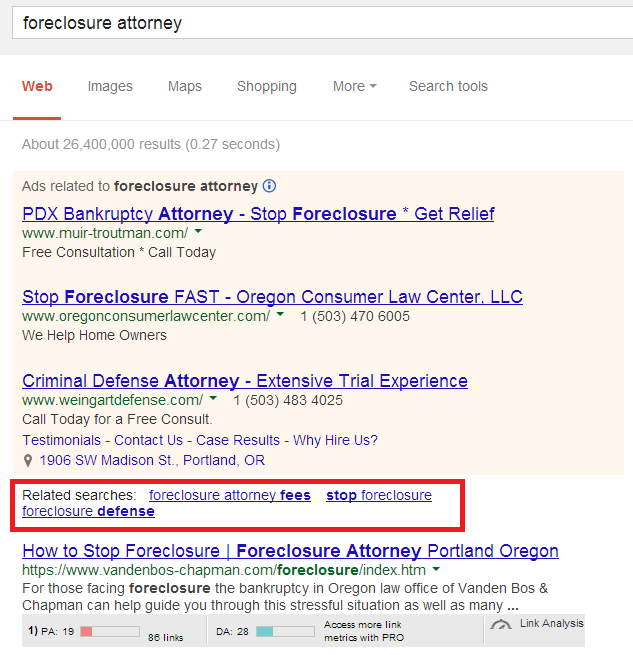 Generally, we expect to see them at the bottom, but in doing some research for a client today, I noticed 3 related searches to “foreclosure attorney” appearing above the SERPs. I’ve also seen this happen one time with an autocomplete client I consulted with. In their case, two related searches appeared right after they started their campaign and they are still there – 6 months later. Why do Related Searches Appear Above Organic Search Results? Great question. In the only case where I witnessed this happen, I believe it was because the client did too many searches with the client’s name all at once. This caused Google to pull a couple of the related searches from the pool at the bottom and place them at the top. They were trying to influence autocomplete and they just hit it too hard. But that’s just a guess. You might also enjoy reading our case study on how we fixed Searches Related To for a recent client. Call 503-890-6663 if you would like to learn more. This entry was posted in Uncategorized on January 9, 2014 by Mike Munter. The screenshot above is from https://support.google.com/websearch/answer/106230?hl=en. What Google is telling us is that if there is no content relevant to your search activity, then the algorithm is less likely to update it’s suggestions for the searches you’re performing. For example, if we were searching for the term “Joe Smith Lollipops,” it would help if Google had indexed pages with “Joe,” “Smith,” and “Lollipops” on them. In my opinion, it would help even more if all three of those words were in the title of at least one web page, as the title of a page is a strong indicator to Google what that page is about. Without relevant content, it’s less likely that Autocomplete will change. So, looking at this from a reputation managment perspective, if you want to push out a negative suggestion, you’re going to need both search activity and content that is both about the same topic. For clients who don’t have a strong presence online, it can be difficult to come up with enough unique search terms to make your campaign successful. Here’s how you can create the content yourself (or we can do it for you for an additional fee). The easiest way to do this is to setup a blog using free software at WordPress, Blogger (need to be logged into your gmail account), or Weebly. I’d claim joesmithlollipops.wordpress.com and then I’d write 500 words of unique content about Joe’s love for lollipops or how Joe always gave his grandchildren lollipops when they visited, or whatever. It’s not rocket science, it just has to be unique. This is sort of a silly idea of how you could go about creating content that’s going to be relevant to your searches, but I use it to demonstrate my point. This isn’t to say that you can change Google autocomplete WITHOUT content; maybe you can. I’ve seen other people do it. I just haven’t invested the time to do it myself. How Did The Negative Suggestions Get There In The First Place? My personal feeling is if you have low search volume for your name or business name, it’s much easier for new content alone to influence the suggestions about you. Names and businesses with higher volume are going to adhere more closely to Google’s indication that content plus search activity equals autocomplete suggestions. We could theorize this all day long, but in the end, all you want is for the negative stuff to go away, regardless of how it got there. And that’s what my team and I help you do. 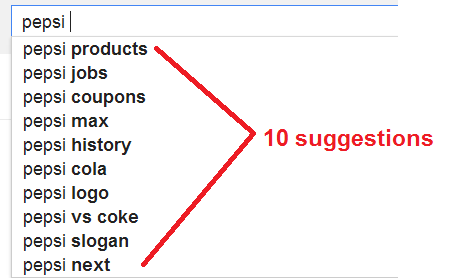 I believe search activity is more important than content, when it comes to Google autocomplete. I’ve seen mulitple cases like the goofy example above using “Joe Smith Lollipops,” where one, well-written, unique, optimized piece of content combined with adequate search activity has caused autocomplete to include the term(s) we were searching for. In my case study about a client who’s negative suggestion and home city started with the same two letters, we had to create a series of blogs for terms beginning with “Du—“. No matter how silly those blog titles were, once we performed the searches and accumulated enough volume, Autocomplete updated to include them as suggestions next to the client’s name. Google is constantly updating it’s algorithm to modify what we see in it’s organic search results and I suspect they may one day modify how their autocomplete algorithm displays suggestions. Let’s hope they tell us when/if they do. For now, we’ve got a decent understanding of how it works, and that makes it fairly straightforward how we can change it. If you have questions about the suggestions that appear next to your name or business name, give me a call at 503-890-6663. Your consultation will be confidential and I’ll give you an idea of what it will cost and how long it will take to change the suggestions next to your name. This entry was posted in Uncategorized on November 30, 2013 by Mike Munter. Does Location Matter To Google Autocomplete? You bet it does! As Google becomes more localized in it’s search results, the suggestions we see from one city to the next can also be different. We make it a practice of checking a few different cities – including the one where you do business – to see if Google’s autofill is the same. If the suggestions are the same in a variety of different cities, our work is easier. All we have to do is have our team perform the necessary searches, no matter where they are located. If, however, the autocomplete results are different in your city, than they are in another city, than it’s probably going to take a number of localized searches to ensure your campaign is a success within your home city. Thankfully, Google makes it as easy as 1-2-3 for us to see the suggestions from one city to the next. Follow the steps below the image. 1) Go to Google and under the search bar, click “Search tools” (#1 in the image). Note – You won’t see this option if Google has just been launched and is in the center of your screen. You have to perform a dummy search and hit enter. Then the Google search box will move to the top of your screen and you’ll see the “Search tools” option. 2) Next, click the little downward arrow (#2 in the image). Now, you can see how your Google suggestions appear to users in that city. It’s becoming more common to see different suggestions between the cities where you do business and cities outside of your market. For example, a real estate investor who flips houses in Los Angeles and San Diego may see that “scammer” is the 1st Google suggestion in those cities, but in Chicago, Boston, and Seattle, “scammer” is the 5th term. This is a clear indication that search volume may be different for the different cities, online content may be geo-targeted, and it’s going to require a specific campaign made up of search activity in Los Angeles and San Diego in order to change those local results. I know it’s a bit confusing, but we work with you to make sure you get the results you want to see in the cities that are important to you and your business. Our search team is spread out all over the world. We have pretty good coverage and we’re always growing; however, if your Google auto-suggestions are different in different cities, then we have to account for that. If you wind up working with someone else besides me to help with your problem, make sure they are accounting for localized suggestions; otherwise, it’s possible your autocomplete problem could be fixed in every city EXCEPT the one where you live and do business. Certainly, it’s more time consuming to target searches for you in a local market. It requires careful planning to ensure proper search volume AND proper location, in order to get the results you want to see in your home city. If needed, we ramp up with additional team members who live in your target city, to make sure you get the search activity where you need it and achieve the results you desire. You can also join the effort by following our Autocomplete Fix – DIY instructions. Your family, friends, colleagues, and volunteers can aid our effort. Every little bit helps. Can Autocomplete “Go Local” At Any Time? Yes. I’ve seen at least two cases where when we began a campaign for a client, there autofill suggestions were the same in multiple cities. However, a couple months into the campaign, we noticed different suggestions in different cities. Usually what happens is if a client lives or does a lot of business in a certain city (or cities), they are more prone to seeing different suggestions in those cities then they are in the rest of country. We’re working on a case like this right now where we’ve fixed the client’s negative results in every city EXCEPT the two major cities where he does business. So, we’ve concentrated our efforts with people who live in those cities to ensure that that we build enough search activity to knock out the negative suggestion. Certainly, “going local” creates much more work, particularly for high volume clients – as you need to have a diverse base of people within a city performing your positive searches on a regular basis. We’ve got good coverage in most major cities and we’re building our network each month, so that we can have greater control. Have an autocomplete problem you need fixed? 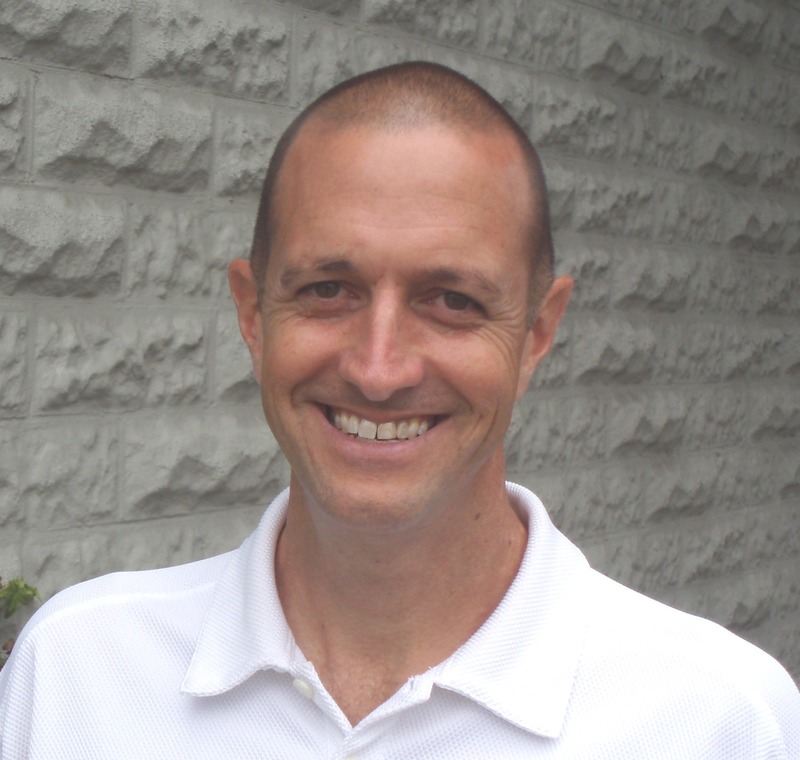 Give Mike a call at 503-890-6663 for a private consultation. This entry was posted in Uncategorized on November 29, 2013 by Mike Munter. In the case study below, I’ll examine the relationship between Google Autocomplete and how it correlates to it’s Keyword Planner data. In the case below, we successfully helped a client remove the word “scam” as one of the suggestions when you type her name into Google. Now that the case is in the rearview mirror, let’s see how the data we collected during our work matches up with what’s being reported by Google’s free Keyword Planner tool. Please note that all names and keywords in the example below are changed to protect the confidentiality of the client; however, the numbers, dates, and all other facts are actual. Client first contacted us because her name was being autocompleted with “scam” when she typed “Jane Doe” into Google. We did some keyword research and found that Google reported ZERO search volume for the keyword term “Jane Doe scam,” which makes us wonder why Google suggests it in the first place, but that’s another story. With the client’s help, we assembled the following list of 17 positive search terms she had relevant existing content online for. We began performing searches for all of the positive terms listed above, aiming for about 20 searches per month. After about 4 weeks, the term “Jane Doe scrapbooking” is added to the list of suggestions. “Jane Doe scam” is still one of the suggestions. “Scam” is pushed out of the search results after about 2 months of performing positive searches. Of course the client was very happy with the result and after tapering down the searches to about 50% of our previous volume, we stopped searching altogether on July 31, 2013. After about 3 months of performing no searches at all, we decided to check Google to see what the Jane Doe autocomplete suggestions were. We see there are NO SUGGESTIONS now. It appears as though Google’s autcomplete algorithm has recognized that there has been no search volume (at least by our team) over the last 3 months and the suggestions have been updated to reflect that. Our next step was to take a look at the data provided by Google’s Keyword Planner. We ran a report with our original 17 positive search terms to see what Google would report for the search volume for each one. We also added “Jane Doe” and “Jane Doe scam” to the list. There are ZERO reported searches for “Jane Doe scrapbooking,” even though we searched for that term as much as the other terms. We would have expected to see each term in the list above have 10, 20, or 30 searches per month in the months we actually performed the searches. But we didn’t. Instead, we see that only 3 of the 17 terms we searched show any volume at all. And even then, the volume does not match up with the months in which the actual work was completed. As you can see from the chart above, the search volume being reported by Google’s Keyword Planner is far different from what we would have expected to see. Not only is the volume incorrect, but so is the timing. Thus, it appears as though the data in the keyword planner should only be used as a guide, and not as fact. There is no search volume for the term “Jane Doe scam,” going back through October 2012, which begs the question, “How did ‘scam’ get their in the first place?” This either confirms our assumption in point #1 above or it could indicate that Google uses content signals to form autocomplete suggestions. After two months of performing positive searches in Google, Jane Doe’s autocomplete problem was fixed. After about 3 months of performing ZERO searches, all suggestions were gone. For keywords with low search volume, it appears to take between 2-3 months for the suggestions to change. As overall search volume disappears, so do the suggestions. After 3 months of performing no searches, we noticed that when we type the client’s name into Google now, no suggestions appear. It’s reasonable to expect “Jane Doe scam” could appear again as a suggestion, just like it did in the first place. We’ll be sure to check on it in the future, but for the time being, our assumption is that once autocomplete is fixed, some ongoing maintenance might be a good idea as insurance against the negative term(s) re-appearing. Have an autocomplete problem you need fixed? Give Mike a call at 503-890-6663 for a confidential consultation. This entry was posted in Uncategorized on October 27, 2013 by Mike Munter.